Book Batik Air flights & plane tickets on NusaTrip.com. Search any flight routes, compare prices with other airlines : Simple & Fast, 24/7 instant booking. Full service airline, servicing Indonesian main cities. Find all Batik Air flights on all routes, get the cheapest fares in Indonesia when booking your Batik Air plane tickets, cheap, on NusaTrip.com. Batik Air, a Lion Air Group company, is a full service airline which started operations in May 2013. This is the 2nd full service airline to operate inside indonesia (after the national carrier Garuda Indonesia). Date Established: 3 May 2013 (first commenced operations). Hubs : Soekarno Hatta International Airport Jakarta & Sam Ratulangi International Airport Manado. Business Class : The Business Class service comes with 45 inches legroom, delicious meals and 30kg free bag allowance, allowing you to travel in absolute comfort and Personal TV (in-flight entertainment system). Cabine : Passengers are permitted one (1) piece of cabin baggage, which must have a maximum length 40 cm, width 30 cm, and depth 20 cm; the sum of the three dimensions shall not exceed 115 cm (45 in.) or weight of 7 kg. Check-in : For economy class, Batik Air sets policy baggage weight limit up to 20 (twenty) kilograms and up to 30 (thirty) kilograms for business class. Batik Air accepts bicycles, surfboards, golf clubs or diving gear at no extra charge. Batik Air provides the best way to pass time onboard, passengers can enjoy favorite Hollywood shows onboard at their personal TV in every seat. For the young ones, keep them busy with great selection of games and you may ask the cabin crew for CUBBO in flight kids magazine. Headset is available with additional price. Check in usually starts 2 (two) hours before the departure time, check-in counters will be closed 45 (forty five) minutes before departure time. In Jakarta (Soekarno Hatta International Airport), Batik Air operates out of terminal 1 and 2. Soekarno-Hatta International Airport Jakarta Departure : Terminal 1C for domestic and 2D for international flights. Batik Air has the right not to carry infants under the age of 7 days. Babies between the ages of 3 to 7 days must have a medical certificate which states that the baby can travel by plane. The medical certificate shall be issued not more than 72 (seventy-two) hours before the flight. 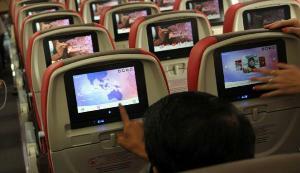 Batik Air to limit infants less than two years of age. Ticket price including food on board. Ticket refund and exchanges are permitted with payment of fee and fare difference (if any) and within a defined deadline. Name Change is not permitted.